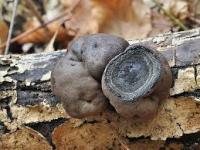 Fruiting body: hemispherical; 20 – 80 mm diameter; glabrous; dark brown becoming black. Flesh: hard, concentrically zoned in alternating silver grey and black bands. Notes: The genus Daldinia is immediately recognised by the concentric banding of silver grey and black bands. Although this has been given the name Daldinia concentrica, it is known that there are about 30 species and many are host specific, this is likely to be a different species and the host needs to be recorded.